Lecture 5: Property Distributions, water masses, and tracers. The distribution of water masses and their properties around the global ocean, including typical property profiles, and examples of meridional and zonal sections of water properties in the Atlantic, Indian, and Pacific Oceans. Identifying water masses on a T/S diagram. Conservative, non-conservative, and transient tracers. Two objectives of studying the general circulation are to determine the velocity structure and also the pathways for water parcels. We are also interested in the fluxes of various properties. For physical oceanography and climate, heat and freshwater fluxes are of interest. For climate and biogeochemical cycles, fluxes of other properties such as carbon and nutrients are of interest. Most of our knowledge of the circulation is somewhat indirect, using the geostrophic method to determine velocity referenced to a known velocity pattern at some depth. If the reference velocity pattern is not known well, then we must deduce it. Deduction of the absolute velocity field is based on all of the information that we can bring to bear. This includes identifying sources of waters, by their contrasting properties, and determining which direction they appear to spread on average. Water properties are used to trace parcels over great distances. Over these distances, parcels mix with waters of other properties. It is assumed that mixing is easier along isentropic (isopycnal) surfaces than across them and certainly changes in T/S characteristics do often compensate (so that density remains unchanged). However, it is clear from distributions of some properties that of course there is mixing both along and across isopycnals (isopycnal and diapycnal mixing). This tracing of waters is useful (in conjunction with the relative geostrophic flow calculations that can be made from the observed density field), in order to describe the average general ocean circulation. We use the concept of water masses as a convenient way to tag the basic source waters. The definition of a "water mass" is somewhat vague, but is in the sense of "cores" of high or low properties, such as salinity or oxygen, in the vertical and along isopycnal surfaces. A range of densities (depths) is usually considered for a given water mass. Water mass definitions may change as a layer is followed from one basin or ocean to another, particularly if the trans-basin exchange involves mixing. Traditionally, water mass analysis was based on plotting various properties against each other, and attempting to explain the observed distributions of properties as a result of mixing between the identified "sources". However, point sources of waters occur only in relatively few regions, and in general "source" waters have a range of properties. The sources are almost always surface waters, or near-surface waters that are created by, say, air-sea interaction, brine rejection, or flow over and through a narrow passage/sill. The most commonly used property-property displays are (a) potential temperature vs. salinity, and (b) properties along isopycnal surfaces. Figure. Potential temperature versus salinity along 20 and 25W in the Atlantic Ocean, from Iceland across the equator to South Georgia Island. Blue - equator to Iceland. Red - equator to about 30S. Green - 30S to South Georgia Island. The Atlantic 25W meridional potential temperature and salinity sections were already shown. Seawater properties are valuable tools for tracing water parcels, because water mass formation processes imprint distinct properties on the water parcels. They are of most use when the sources and sinks of one property compared with another differ. Some tracers are biogenic and hence non-conservative. These include oxygen and the various nutrients, all discussed very briefly here. Some useful tracers are inert but with time-dependent inputs, such as chlorofluorocarbons (CFCs). Some useful tracers have decay times and decay products, which can serve as a useful measure of age, such as bomb tritium and helium. The latter are referred to as transient tracers, and are not discussed here. 8.1. Oxygen. Non-conservative tracer. The atmosphere is the primary source of oxygen in the ocean and surface waters are usually close to saturation. Per cent saturation of oxygen depends strongly on temperature. Cold water holds more oxygen. Below the surface, oxygen concentration decays as a result of consumption by organisms and by oxidation of detritus (marine snow). Therefore, oxygen content decreases with age, so it can be used in a rough way to date the water, particularly at depth where consumption is very small. However, it is not a precise age tracer because the consumption rate is not a constant. Also, since waters of different oxygen content mix, the age is not simply related to concentration. 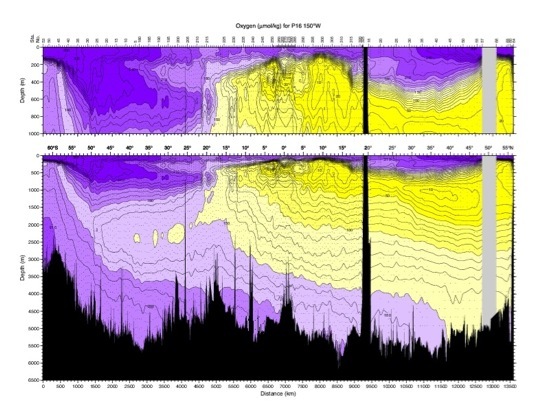 However, low values of oxygen, such as those found in the North Pacific deep and intermediate layers, are an indication of waters that have been away from the sea surface for a long time. In the Black Sea there is no oxygen (anoxic) but hydrogen sulphide is present instead (from reduction of sulphate by bacteria). This indicates very stagnant deep waters. 8.2. Nitrate and phosphate: Both non-conservative. Nitrate and phosphate are completely depleted in surface waters in the subtropical regions where there is net downwelling from the surface and hence no subsurface source of nutrients. In upwelling regions there is measurable nitrate/phosphate in the surface waters. Nitrogen is present in sea water in dissolved N2 gas, nitrite, ammonia, and nitrate, as well as in organic forms. As water leaves the sea surface, particularly the euphotic zone, productivity is limited by sunlight and nutrients are "regenerated". That is, the marine snow is decomposed by bacteria and produces nitrate and phosphate. Nitrate and phosphate thus increase with the age of the water. Vertical sections and maps of nitrate and phosphate appear nearly as mirror images of oxygen, but there are important differences in their patterns, particularly in the upper 1000 meters. Nitrate/oxygen and phosphate/oxygen combinations - nearly conservative tracers. Nitrate/oxygen and phosphate/oxygen are present in seawater in nearly constant proportions, given by the Redfield ratio. The Redfield ratio is C:NO3:PO4:O2 = 105:15:1:135. There are small variations in this ratio, with particularly large deviations near the sea surface. Because of the near constancy of this ratio, a combination of nitrate and oxygen and of phosphate and oxygen is a nearly conservative tracer (Broecker). 8.3 Dissolved silica - non-conservative. In seawater it is present as H2SiO4 (silicic acid) rather than silicate (SiO3), but many people use the term silicate. This nutrient is also depleted in surface waters similarly to nitrate and phosphate - completely depleted in downwelling areas and small but measurable quantities in upwelling areas. Subsurface distributions of silica look something like nitrate and phosphate and mirror oxygen since silica is also regenerated in situ below the euphotic zone. However, silica in marine organisms is associated with skeletons rather than fleshy parts and so dissolves more slowly in the water. Much of the silica thus falls to the bottom of the ocean and accumulates in the sediments. Dissolution from the bottom sediments constitutes a source of silica for the water column which is not available for nitrate, phosphate or oxygen. Another independent source of silica are the hydrothermal vents which spew water of extremely high temperature, silica content, and helium content, as well as many other minerals, into the ocean. These three quantities are used commonly to trace hydrothermal water. How deep is a typical mixed layer if mixed by wind? How deep can it reach if driven by cooling? What are the typical veritical temperature profiles in the subtropical and subpolar regions of the North Pacific? What is the typical number of layers which people use to describe the ocean in general in mid-latitudes? What are the most general names and typical depth ranges of the layers? (Do not name a specific water mass like "North Atlantic Deep Water"). What is the volumetrically most common water on earth and where is it found? Is the North Atlantic Ocean saltier or fresher on average than the Pacific? What regions of the ocean are characterized by large differences from summer to winter? What regions have the least seasonal variability? What is the densest water mass formed in the world's oceans? Why is it not found at the bottom in most oceans? Draw cartoons of vertical, meridional sections of salinity for each ocean, showing the "tongues" of the major water masses.